Adaptation to climate change is given increasing international attention as the confidence in climate change projections is getting higher. Developing countries have specific needs for adaptation due to high vulnerabilities, and they will in this way carry a great part of the global costs of climate change although the rising atmospheric greenhouse gas concentrations are mainly the responsibility of industrialized countries. This article provides a status of climate change adaptation in developing countries. An overview of observed and projected climate change is given, and recent literature on impacts, vulnerability, and adaptation are reviewed, including the emerging focus on mainstreaming of climate change and adaptation in development plans and programs. The article also serves as an introduction to the seven research articles of this special issue on climate change adaptation in developing countries. 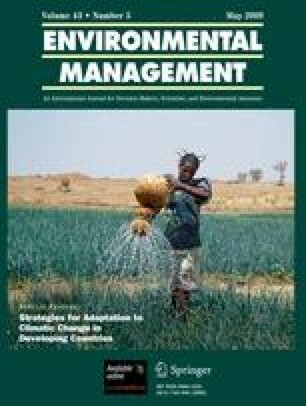 It is concluded that although many useful steps have been taken in the direction of ensuring adequate adaptation in developing countries, much work still remains to fully understand the drivers of past adaptation efforts, the need for future adaptation, and how to mainstream climate into general development policies. This special issue is the final outcome of a process started by the conference “Bridging research and development assistance: Strategies for adaptation to climate change in developing countries” held in 2004 in Copenhagen and organized by Research Network for Environment and Development (ReNED, now merged into Danish Development Research Network, DDRN; www.ddrn.dk). The conference was funded by the Danish Ministry of Foreign Affairs. Development of this article was partly supported by the African Monsoon Multidisciplinary Analysis (AMMA) project. Based on a French initiative, AMMA was built by an international scientific group and is currently funded by a large number of agencies, especially from France, the United Kingdom, the United States, and Africa. It has been the beneficiary of a major financial contribution from the European Community’s Sixth Framework Research Programme. Detailed information on scientific coordination and funding is available on the AMMA International website: http://www.amma-international.org.